All members are invited to submit work to exhibitions, and urged to attend the annual meetings and ASMA shows, to contribute to our quarterly News & Journal and to serve on committees. Signature members and Fellows are obliged to submit work for ASMA National Exhibitions. The Society depends for its existence on the time and effort volunteered by individual Members. The ASMA website includes a gallery of all work which was hung at the last National Exhibition. In addition, Signature members and Fellows have the opportunity to apply to have up to three more of their works posted on the website (subject to review), and to have a link created between the Society website and their own. 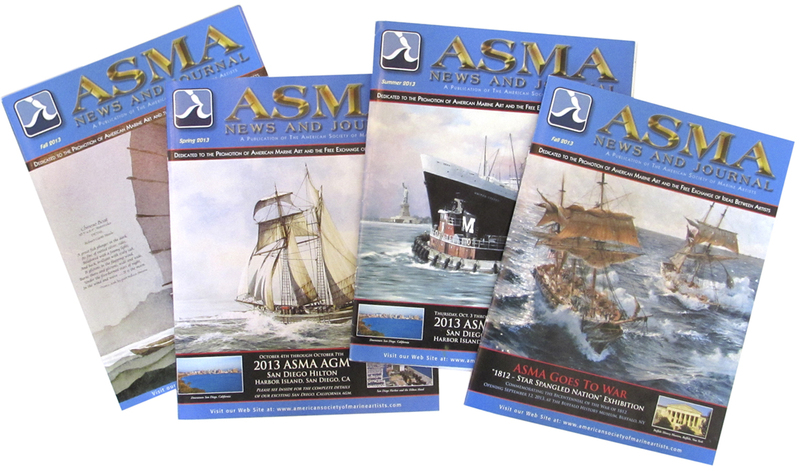 Members receive the Society's full-color quarterly magazine, the ASMA News & Journal, which includes articles about other members, maritime history, techniques, and exhibiting opportunities. Members are also welcome to register for our National Conference, which includes demonstrations, paint-outs and socializing with fellow artists. Our next National Marine Art Conference will be held in Jamestown, VA, with demonstrations beginning March 5th through the 7th, 2020. Each year, the Board and Fellows host an Annual General Meeting in the fall. All artists are always welcome to attend the annual get together. Student Member: Students in high school, college or university under the age of 23, and who may be contemplating going into the field of marine art, are warmly encouraged. Young Marine Artist Search - If you are a student with a passion for painting and sculpting maritime subjects, including seascapes, marine life, coastal landscapes and all things from the sea, we want you! The American Society of Marine Artists is dedicated to finding and encouraging young marine artists through exhibition opportunities and education. Student Membership is only $15/year. Applications are being accepted for Fellowship February 8, 2019 through March 11, 2019. There is a $130 fee for the portfolio review for Fellow Membership. Applicants submitting for consideration to ASMA Fellow status must first be a Signature Member in the ASMA. Signature Members, particularly those who have exhibited with the ASMA for some years are encouraged to apply for election to the Fellowship. The Fellows are responsible for maintaining the artistic standards, and managing the artistic affairs of the Society. Those members submitting for Fellow should do so with the understanding that, if elected, he or she will be encouraged to contribute to the Fellowship or the Society in some fashion best suited to their individual artistic excellence and/or professional experience. All Fellows will be asked to serve one term on the Fellow Management Committee. This is a three year term, consisting of Deputy Managing Fellow, Managing Fellow and Post Managing Fellow to assist in managing our portfolio reviews each year and any national exhibitions for the Society. Please contact any Fellow currently serving on the FMC for further information. Annual dues: $125.00. Twenty images are required for review, including the dates of when each work was created. If accepted into the Fellowship, there will be an additional fee of $25.00 to cover the difference in membership dues from Signature Membership to Fellow. Fellows are entitled to use the initials F/ASMA after their name. Fellowship does carry some responsibilities to the Society. Please read all information included on the application for full details. We are accepting submissions for Signature Membership February 8 - March 11, 2019. There is a $ 75 fee for the portfolio review for Signature Membership. Twelve images are required for review for Signature Membership. Sculptors are required to submit 2 views for each artwork. If accepted, there will be an additional fee of $100.00 to cover the cost of Signature Membership dues for all Non-members. Regular Members of the Society will be charged an additional $35 fee, if elected as a Signature Member. These fees cannot be accepted until after jury notification is received. Website images will not be posted until June, 2019, after all newly elected Signature Members images are in and the Signature Gallery has been completely redesigned. Renewal fees will be payable annually with membership renewals notice. It is a Signature Members’ responsibility to include payment of their website renewal fees with their membership dues. Those failing to do so will have their work removed from the website gallery. ASMA will be redesigning its website in the coming months in 2019. Work will begin in mid-April and up and running by June of 2019. The website will be designed in sections, with the Signature Gallery being completed first. All Signature Members with a current Signature Gallery page are being encouraged to submit 3 of their very best works, to replace their current images. We will do this for a one time price of $15.00 to put up 3 new images. Regular price is $40! If you are currently a Signature Member who does not have an existing Signature Gallery page, please send three of your very best images for review, along with a check for $30.00 to: ASMA - PO Box 2903 - Gainesville, GA 30503. If you would also like a website link from your Signature Gallery page to your website, add your website address for a special one time offer of $5.00. (Total $35 for 3 images and your website link). Regular price: $65.00. Online: Select the your Membership Level below and continue to the application and payment processing online. Applications are invited from U.S. citizens, U.S. residents, companies, societies, institutions, and from anyone elsewhere who has an interest in the field of American Marine Art.